This backyard barn has two big parking bays, behind 9' wide by 8' high sliding doors, for your cars, trucks or SUVs. A back garage will park another car, truck, tractor or small boat. There's a side shed for a farm tractor or snowmobiles and a big work shop for your projects or hobbies. Pull-down stairs and an optional exterior hatch give access to a big loft for even more storage. 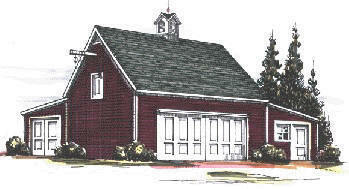 The Pine Knoll Barn has a pole-barn frame for simple, inexpensive construction. Floor Area: 1,152 Sq. Ft., Loft Area: 576 Sq. Ft.